Home » » Turf » Welcome to the OGC Turfcare Blog! Welcome to the OGC Turfcare Blog! 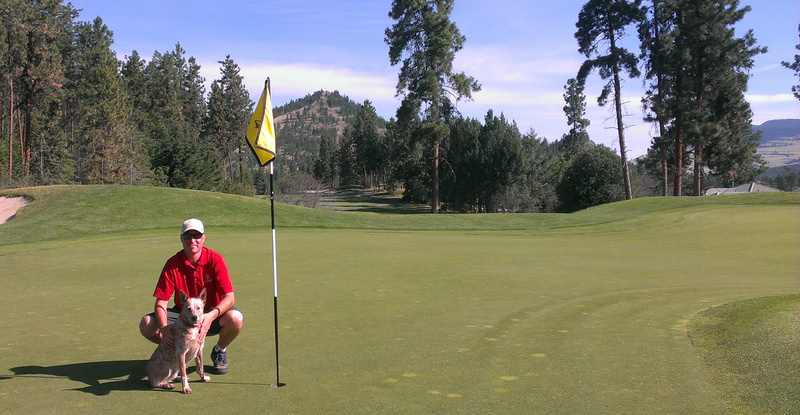 Welcome to the Okanagan Golf Club Turfcare Blog! Here you will find information about the maintenance of our courses and other topics related to course conditions. The purpose of this blog is to increase education as to what kind of maintenance we do, why we do it, and how it relates to the most important thing of all – your golf game! Since this is my first blog post ever, I think it would be very appropriate to introduce myself in attempt to help explain some of my general golf course maintenance philosophies and theories. My name is Adrien van Dyk and I am the Superintendent of the Bear and Quail courses at the Okanagan Golf Club. If you have seen me out on the course you have probably also noticed my sidekick “Monty” running alongside of me. I am responsible for implementing and overseeing all maintenance practices related to the playing conditions on the golf courses. I have had many varied experiences which have led me to this position at the OGC. My foundation in agronomics has certainly came from my many years of experience in agriculture working for my grandparents low bush wild blueberry company in Nova Scotia. I began working in this business as far back as I can remember. I was involved in all aspects of the company, but most notably I spent four seasons as a field manager. In this position I built nutrient management programs, weed management programs, and managed personnel for nearly 1000 acres of blueberry land. Since wild blueberries are a perennial crop, their management is actually very similar to that of turfgrasss. My experience in the golf course industry began when I was in high school where I helped my father, who owns an excavation company, build a 9 hole golf course. I was able to be a part of nearly every aspect of the construction right from design to the actual growing in of the turf. Once the course was fully constructed and open, I worked for three years as a green keeper doing literally everything there was to be done. It was right after this position that I worked as a field manager for the blueberry company during the summers while I was taking my Bachelor of Technology in Environmental Horticulture. I eventually returned back to the golf business and started working as a spray technician at the Links at Penn Hills Golf Course in NS, later becoming the Assistant Superintendent there. I then moved on to be an Assistant Superintendent at the Greywolf Golf Course in Panorama, BC. During the off seasons at Greywolf is when I studied at The Pennsylvania State University to specialize in Golf Course Turfgrass Management. After graduating from Penn State, I obtained the Assistant Superintendent position at the Tobiano Golf Course in Kamloops BC. Working at Tobiano was by far the biggest highlight of my career to date. The experience that I gained in that position was absolutely invaluable and very well prepared me for the Superintendent Position at the Okanagan Golf Club. If you have ever been to Tobiano you may understand when I say that it is truly one of the most special places on earth. Kelowna is definitely my new home, and I could not be happier to be a part of the Okanagan Golf Club Team. We truly have two gems in the Bear and Quail courses, and it is such a pleasure to be able to play two very unique designs at one site. I hope you enjoy playing them as much as I enjoy looking after them. Now that you know a little bit about me and my experiences, my following posts will focus on specific course maintenance issues. Expect very soon to see a blog post all about topdressing. See you out on the course.